June 2011 – Kitmeout Designer Clothes – Fashion Blog & Fashion Forum. Fashion photographer Graham Lott teamed up with the Creative Agency Boyce & Brown to create a short cinematic video showcasing the Gilded Age Fall/Winter 2011 Collection. Inspired by patriot Joseph Lloyd’s paranoid flight from Long Island after the British seized it, the project brings the area’s past into its present, fusing the land’s history with current-day suburbia. The Swedish brand marched out in sportswear with a seventies twist. Including trim suits, crisp windbreakers, shorts doused in a camouflage-like floral print and a suede blouson with an oversized ribbed waistband. Colors were offbeat — putty pink, brown and rust — but Acne also sent out some of its famous denim. Acne Jeans unites innovative jeans styles with a versatile wardrobe for men and women, ranging from basic cotton T-shirts, to tailored jackets to luxurious accessories and shoes. While every collection forms a concept, each piece can be worn separately and effortlessly be mixed with other brands. By designing simple, functional clothes Acne Jeans aims to create a modern framework for individuality. As a part of the creative collective ACNE, the label started in 1997 when the company designed 100 pairs of jeans distributed to friends, family and clients. Soon, several stores and boutiques wanted to carry the line, much to do with the characteristic bright-red stitching on raw denim. From these humble beginnings Acne Jeans has developed into a renowned jeans. The first ‘real’ collection was launched in 1998. Since then Acne Jeans’ Creative Director Jonny Johansson has worked with a strong design team to create a strong identity for the brand. Antonio Marras takes a leisurely stroll in to the 50s. Antonio Marras (Alghero, 1961).It is stated in the international fashion world for his original creations and a personal style all related to the Sardinian culture made ? ?of simple materials and traditional and enriched by his elaborations. His reputation is now linked to the fact that by his merits he was appointed artistic director of French fashion brand from Kenzo. Slouchy suits with short pants came in electric brights, or sun-faded pink and blue cottons. A tropical garden’s worth of prints also bloomed across the collection, from a big pink hibiscus on a white linen suit to an intricate vintage design depicting palm trees and tigers. Chunky brogues, knee socks and sensible fisherman’s hats gave this holiday garb an endearing, nerdish quality. Rick Owens Menswear continues to push boundaries in 2012. Long silhouettes with floor-skimming coats and gowns were presented, creating a semi-religious undertone evident throughout the collection. Rick Owens (born 1962) is an American fashion designer hailing from California, celebrated for his avant garde and subversive eye. Stefano Pilati, inspired as usual, focused on uniform tailoring but mixed in laced-up string details and red crocodile loafers. Stefano Pilati (born 1965) is an Italian fashion designer. Since 2002, he has been the head designer of the fashion house Yves Saint Laurent. The fashion house Georgio Armani hired him as an assistant in its men’s ready-to-wear department in 1993, and the fashion house Prada asked Pilati to run its fabric research and development in 1995. In 1998, he was promoted to assistant designer at Miu Miu, a brand of Prada, working on men’s and women’s ready-to-wear clothing and reporting directly to Miuccia Prada. In 2000, Pilati joined fashion house Yves Saint Laurent to run its ready-to-wear clothing design; he took over in 2002. After launching his eponymous denim line in the fall of 2006, menswear designer Simon Spurr has released a limited-edition jean to commemorate the company’s five-year anniversary. Crafted with the finest details, the SIMON SPURR 5 Year Anniversary Jean uses wash details and hand-finished repairs inspired by the original pair that Spurr has worn over the past five years. Adding to their individuality, each pair is signed, numbered and dated by Spurr. Using custom yellow selvage denim, produced by Cone Mills in North Carolina, SIMON SPURR jeans are defined with branded buttons and rivets along the chain stitching at the waist band and hem. For extra softness and give, pima cotton is used in the weft of these medium-rise, straight-cut slim “Made in the USA” jeans. In the fall of 2006, Simon Spurr launched his menswear line SPURR with three distinct styles of American-made selvage jeans. Over the course of 2007, the line was expanded to include sportswear, suiting and accessories, quickly establishing SPURR as a full lifestyle brand. In 2009, the brand was broadened once again with the creation and development of SIMON SPURR, a designer collection which paralleled and complemented the newly-contemporized SPURR. Spurr’s clean and confident design aesthetic is clearly informed by both his English upbringing as well as by his years working with Hedi Slimane, Calvin Klein and Ralph Lauren. In 2009, Spurr received the prestigious nomination for the CFDA/VOGUE Fashion Fund Award and has since been nominated for two CFDA Awards, most recently for Menswear Designer of the Year. SIMON SPURR and SPURR are sold at leading retailers worldwide including Bergdorf Goodman and Saks Fifth Avenue. Captain Fin Company was started in late 2007 by pro surfer Mitch Abshere. He created Captain to tell a new story in surfing, rooted deeply in anti-establishment, but also in having fun. The foundation of the brand lies in the graphic oriented fins that are designed by the best artists/riders possible, but the Captain product line is also growing to include T-shirts, accessories, and whatever else Mitch wants to make. The possibilities are endless, but at the end of the day, Captain Fin Company is just about making RAD stuff, without following any rules. The Stussy Summer 2011 collection includes a series of t-shirts by animator JJ Villard. A graduate of CalArts, JJ has worked on huge Hollywood films such as Shrek the Third, Shrek Forever After and Monsters vs. Aliens before landing his current gig at Cartoon Network Adult Swim. personal work is drastically different from the high profile projects he typically works on. Inspired by pop culture, horror films and things of a darker nature, JJ used the idea of a sketchbook to inspire his tees. Using pens, pencils and markers, he created a series of t-shirts that capture the rawness of what a sketchbook is all about. Moncler is a famous name that is familiar to anyone who loves the mountains and easy wear. The name comes from the abbreviation of Monestier de Clermont, a place near Grenobie where, in 1952 Rene Ramillion and Andre Vincent founded what would become one of the most famous outerwear companies. Ramillion was the best known manufacturer of mountain articles in the city, but he was also a versatile mind whose talent was demonstrated by dozens of patents. As early as 1933 he had started up a company by that name, specialising in metal mechanisms for sports: ski poles, bindings, and tent frames. He also provided ski bindings to the French Army, and the people he met and events he experienced through this connection proved to be life-altering. Due to “proven need” during World War II, his company was not seized, and through his contacts with the French Alpine troops, he met Lionel Terray, a decisive player in the history of Moncler. During its first few years, the company, headed by Andre Vincent, a Grenoble merchant and a friend of Ramillion, who dealt in sports articles, successfully sold solid, sturdy objects: tents, down sleeping bags, a unique model of lined cagoules, and good sewing machines, recovered from a former slipper factory. The tents in particular met the favour of the market, becoming so famous that they were simply known as “les Ramy” , the symbol of a rapidly developing phenomenon – vacations. Vacations became popular throughout Europe in the 1930’s, but exploded in the post-war period with its new found freedom of movement. They transformed into a ritual that became increasingly popular due to motorcycles, Lambretta scooters (sometimes Vespa‘s), and small cylinder autos that were cheap and manageable. And also thanks to perfect tents, with telescopic poles and outer reinforcement to cover them. Moncler’s history was shifting, and the definitive catalyst bore the name of a glorious weekly magazine, Elle. It’s attentive journalists sensed that this mountain garment could easily become a must for city life. And on that occasion, the down jacket also vaunted eccentric stitching, vertical in some places, horizontal in others and splendid colours, even through the laque nylon of the period came in only four shapes: yellow, blue, orange and green. “It’s a revolution”, enthusiastically exclaimed the editors who photographed it. They showed rare foresight, as the passion for sportswear was still at least ten years away. In 1988 the entire editorial staff of Madame Figaro posed in Moncler down jackets for their Christmas greetings. As it became metropolitan, Moncler’s ascent was unstoppable, and in 1980 it met the designer Chantal Thomas, with whom it began a collaboration that lasted until 1989 and radically changed its appearance: buttons instead of zippers, fur trim, satin, reversible fabrics. Continuing the transformation, in 1999 the first Spring/ Summer collection was presented, and in 2002, for the brands fiftieth anniversary, a couture collection was presented, enriched with embroidery by the famous Lesage. The Emporio Armani menswear collection for next spring and summer was entitled “Lightness.” That’s lightness in fabric and certainly not quality and aesthetics. Suits were layered with loose-knit cardigans, highlighting the lightness of the collection, on top of light T-shirts. Loose jackets were virtually transparent, revealing the shape of the model. The color scheme was masculine and neutral in grays and blues. 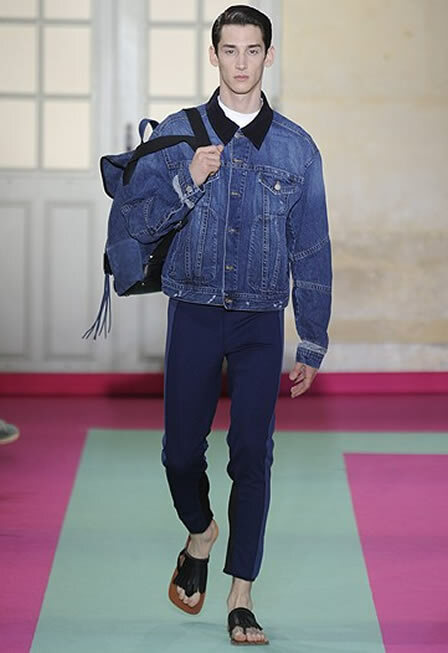 Ex St.Martins London, Class of ‘87, Philip has had numerous lives in the international design world, more recently in the jeans arena working on many creative consultancies with major Euro-denim companies from trend reporting to cool-hunting, product design to image styling. However, in 2000, he was selected to become creative director of little-known, cult Japanese selvedge denim label, Evisu. In this role he was responsible for establishing the original denim product line & for a further 3 years, designed all Evisu product of this highly specialised denim brand, aswell as creating all of the commercial designer lines sold in Europe. In 2003 Ijin Material was conceived as an independent denim research line based on a specialised cutting technique involving folding & instigating the cult of alternative jeans-making. Ijin was shown in January 2004 with a clearly authentic & original signature denim model: the Antifit Backstrap. Ijin immediately sold into Fred Segal LA, Barneys Tokyo, Beams Osaka, Dantone Milano & the legendary Jones London, to name a few. Ijin is still run on a shoestring budget by one person & continues to sell fearless & original product in the best specialist boutiques on the planet, whilst retaining the accolade of world’s best kept denim secret. Philip was still creative consultant to Evisu International during this time, when he was then invited to Japan to collaborate personally with Evis founder & indigo friend ,Yamane-san. In 2005, a new specialist denim line was born for the Japanese market only.This private label is called Evis 9055 – Philip Goss Edition & is still on sale today. In 2011 , in collaboration with Deb Srl, Rimini , alternative jeansmaker Philip M. Goss debuts under his own name with a specialist menswear line rooted in reworked Workwear items, operating researched textiles woven in both rare & authentic Japanese weaves & also totally exclusive Italian narrow-loomed selvedge denims actually woven by Goss himself , consultant textile createur to Europe’s only vintage denim company, DenimArea.Artisinal Italian manufacture combined with veteran British know-how & a Japanese mindset highlights this amalgamation of Heritage with innovation in this inaugural line offer of sturdy utility items including Tailor Labor Jackets , Cambric dress shirts , wide-leg Chinos & a new generic five pocket leg. Meltin’Pot has opened its doors to its first Denim flagship store in Italy, Riccione. Arranged on two levels, the store will be built within the Palariccione complex Riccione, which also houses some of the best shops in the area, located in the center: a 1 km radius from hundreds of fine hotels, the best restaurants, other fashion boutiques, cool bars and the infamous, coastline, all within walking distance. The decision to open the first flagship store in the town of Riccione represents a clear and defined desire to reach out to the brand’s target audience. CEO of the brand, Augusto Romano explained, “This store opening mirrors the International development of the label with plans to develop markets in the Middle East, China, Japan and South America”. “Presently we are developing the brand’s positioning in New York, Miami and LA and the brands 800 Italian based retail points and its other 300 in Europe, in particular France and Germany.” “We are are embarking on an important turning point for the brand, which aims to forge retail partnerships”. “The idea is not to give birth to a chain but rather to develop a partnership with some of our customers, who may open a second Meltin’Pot store that is more structured than a traditional franchising set up”. Riccione in fact, has always been considered the “heart” of the summer Italian vacations Italy, and a prime location for spearheading new trends as well as being a noted international tourist destination, and not only in summer, with its modern facilities, notes boutiques and historical clubs and nightlife, which are famous throughout the world. The pilot flagship Denim store is the first example of a Meltin’Pot jeans branded store, and houses the complete denim collection for men and women. All the fittings and furnishings embrace and emulate “denim world” style, “raw” and industrial, using materials such as wood and steel but with mixed with modern and innovative technology. A massive, “Meltin’Pot” Lifestyle video wall structure transmits real time video content related to collections, advertising campaigns, events. The first Meltin’Pot denim store is also a key marker within the new brand’s new “retail” strategy – a pilot project that anticipates the forthcoming openings of additional Meltin’Pot stores both within Italy and worldwide. The opening was celebrated with a large in-store event and supported by partnerships with the biggest clubs in the area and along the coastline, and one of the most famous and historic Italian clubs, Cocoricò, who on the same date officially celebrated the opening of the official season with its renowned, “One Festival” with international guests and guests in attendance from all over Italy. A major aperitif was also staged with the support of Aperol Spritz, and guest DJ and Dutch producer, and rising star of contemporary house and the disco scene, Trago played an exclusive DJ set for Meltin’Pot in-store, prior to playing his set at Cocoricò. Guests were also protagonists of a “Live Shoot”- featuring a selection of exclusive and collectable T-shirts. The photographic set was staged within the store with: and the best shots taken will shortly feature as part of a gallery, which will appear on the Meltin’Pot blog and via other related social network channels. A fine example of a 5 pocket Limited Edition jean, made in pure 12OZ indigo unwashed denim, with precious selvedge unwashed, and enriched with “hand-made” details and packaged in a special authentic “Raw” way. The Meltin’Pot flagship store Riccione was designed by BAM Design, an architectural and design studio based in Milan and New York, whose signature already appears on some key international fashion brands stores worldwide. Edwin Japan can trace its roots back to the 1950s. However, it’s generally accepted the brand started in 1961. The name “EDWIN” comes from playing with the 5 letters of “DENIM” Reversing the DE to ED and then reversing the NIM to MIN and then flipping the M to make a W: EDWIN! In 1970 more American WORK WEAR clothes are being made. A very important model, the OVERALL becomes a trend. The STRONG JEANS are being made which encourage the HIPPIES. A new folk fashion is born with the PATCHWORK by EDWIN. The CHICAGO JEANS are on the market. There’s a big fuss about the CHICAGO campain that year. Also, the STONEWASH series reaches the market. EDWIN is now on the market officialy via the ELITE FASHION CHANNEL. The sales of the INTERNATIONAL BASIC SERIES, which are the improvement of the WORK WEAR stabilizes. This year the LONDON SLIMS make their debute in Japan, after request of the people who already had heard of the great success the LONDON SLIMS had abroad. USA EDWIN International is founded. Musicians like Kenny Rogins, Hewy Louis and Billy Joel, appreciate the quality and fit of EDWIN clothes by wearing them. EDWIN starts to attract the peoples attention without advertising campains. The production in IOWA, USA begins. This way, the first made in USA EDWIN hit the market. EDWIN merges with the second greatest jeans company in the USA, LEE. This was the result of the fact that the creator of jeans in America had the KNOW-HOW of EDWIN. A video on the opening of the lastest (the next) flagship store. To open a flagship store is always a unique event that gives to a brand a lot of energy. Especially to us, who decided to conceive our stores more as a ‘design pieces’ showcase than a ‘clothes container’. The latest opening, on May 28th, has been in Riccione, a city known for its great daytime beaches, and spectacular nighttime’s discos. The address is Viale Ceccarini 34, the main shopping and bar avenue. The shop opened just a few days before the opening of the shop in shop” of Forte Village in Sardinia and precedes the opening of ur Parisian Flagship store, but this is another story and will be another post…. Here’s a video, shot the day before and the day of the opening. The Billabong Design For Humanity event kicks of with the Runway Show. A one of a kind bikini fashion show showcased on the catwalk by top runway models. This video goes behind the scenes to the casting call. Design For Humanity fashion, music, art event benefiting VH1 Save The Music Foundation. Happening June 15, 2011 at Paramount Studios. Fernando Korpi’s A/W 2011-2012 mens collection draws its inspiration from abandoned factory towns, Twin Peaks -series and The Deer Hunter -movie. Especially hunting trips and the traditional lifestyle of the rural areas are presented in the prints of the collection. Traditional army fabrics and the patterns found in your grandpa’s sweaters have been newly interpreted to represent today’s aesthetics in mens fashion. This approach is recognizable in Fernando Korpi -brand’s collections because in mens fashion the appearance stays the same – just like in cars. Only the technique and the details change to serve modern needs and style. Fernando Korpi designs and manufactures high-quality clothing and other accessories. The starting point for design is that each individual Fernando Korpi product earns its own design value and expresses everyday lifestyle. Burberry Prorsum Autumn Winter 2011-2012 Campaign + Videos. View footage from the Burberry Autumn/Winter 2011 Prorsum Campaign for June, featuring British models Molly Smith, Amber Anderson, Thomas Penfound and Felicity Jones. Style Savage gives us a look at Yasmin Bawa 2011 Graduate Collection from the Middlesex BA show which was held last week. Alexander McQueen has released a new collection of scarves, showcased by the above video, provocatively entitled “God Save McQueen”. Gucci is celebrating the fashion house’s 90th birthday by recreating some of the brands most iconic bags. The 1921 collection, named after Gucci’s founding year, will feature reworked version of old classics. Due out in June, the 1921 line will include new takes on styles like Jackie (named for Jackie O and her love for the Italian brand), Horsebit, and the Bamboo. In addition to enviable purses, Gucci’s 1921 promises fashion-lovers a relaunch of the brand’s signature moccasins and loafers. Timeless Gucci accessories including sunglasses and scarves will also be released in honor of nine decades of impeccable design. The street artist’s latest work of art – a giant shire horse and a young boy – is displayed on the wall of the Swedish brand’s east London office. London-based street artist Donk is putting his stamp on fashion and sportswear brand J.Lindeberg’s offices near Old Street. The work explores aspects of time, transcience and growing up in London. Present in the Chinese market since 1994, Salvatore Ferragamo is further developing its business in China. The fashion company announced the launch of two mono-brand stores, one in UNESCO’s protected Kunming location, and another in China’s third most important city Guiyang. The Kunming store is situated inside of Ginko department store Shinguang shop, which is one of the shopping destinations of the city. This store is set over 256m2 and features different product lines from Ferragamo. Occupying a surface of 151m2, the Guiyang store houses in the only shopping centre of the city. Both of the boutiques are designed according the Ferragamo design concept following a sophisticated and modern architecture. Dating back to 1927, the Salvatore Ferragamo SpA is the parent company of the Group featuring luxury accessories, fragrances and clothing for men and women. Italian craftsmanship breaths through the brand that is available in 578 mono-brand stores in Europe, US and Asia. No natural resource is more precious. None is shrinking faster as people consume more and more. Our Common Waters, Patagonia’s new campaign, is about balancing human water use with the needs of animals and plants. The more water people use, the less there is for everything else. The more water we waste, the more habitat we destroy. The more we pollute our streams and lakes, the harder it is for animals and plants to survive. In this campaign, Patagonia will connect water use, the consumer society and threats to biodiversity. The phrase “water rights” carries a larger meaning in this campaign than our usual use of it: Who and what has the right to water? Existing threats range from increased human water use and water stress to pollution to dams. Each of these is made worse by climate change, which is already altering temperature and river flows. Almost half the animals on the U.S. threatened and endangered list call freshwater home. An essential part of this campaign is Patagonia’s story as a company: the water cost of doing business, reducing our water footprint and reporting on our water use. At Patagonia they’re only beginning to learn just how much water we consume – or how much water is used in our name. As individuals we have to remember that much of the water used in our name doesn’t come out of the tap but rather as our share of the sum of industrial production and consumption. So it’s important for us all to keep an eye on what business does to increase – or meet – the challenges posed by water scarcity and pollution.